The "Year Clock" has one hand and it takes one year to go around. This is an analog of the Earth, which takes one year to go around the Sun. The hand represents the progress of the Earth as it goes around the Sun. When you look at a normal clock face, it gives you a quick visual image of where you are in the day. This clock will give you a quick visual image of where you are in the year. The dial is marked with significant annual astronomical events. It shows the constellations of the zodiac (where the sun appears in space), the months of the year, the solstices and equinoxes, the major meteor shows, and the equation of time. 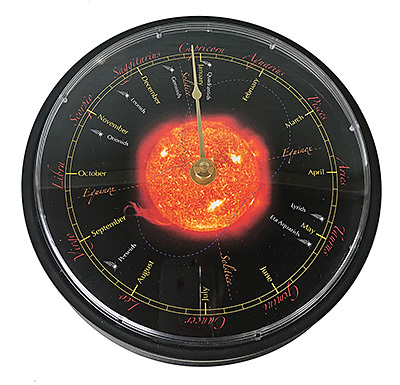 To see a larger image of the dial, click on the image. The Year Clock comes with a pamphlet of instructions that will teach the owner about each element of the dial, and the nature of a trip around the sun. The Year Clock is available in a 12" diameter for $175 plus postage. Each dial is printed as needed. For a small charge we may be able to add one event to your clock face to mark a date that's important to you, if it doesn't conflict with events already on the dial. Please inquire when ordering. To place an order use the Order Page. I also make a Sidereal Clock which shows "star time", a Mars Clock that shows the time on Mars, and a Set of Three clocks that show standard time, universal time, and sidereal time.